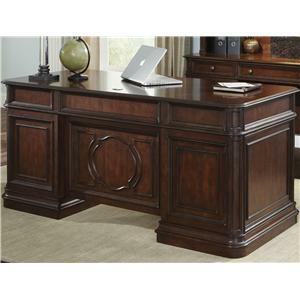 Create a professional work environment with this classically, elegant executive desk. 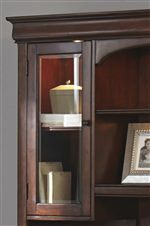 Equipped with ample storage space you can keep all of your most valuable resources organized and available right at your finger tips. Expertly crafted from pine solids with cherry and birch veneers this piece is bathed in a warm brown cherry finish to give your office a cozy feel. Stacked crown mouldings, and framed panels give a traditional design. 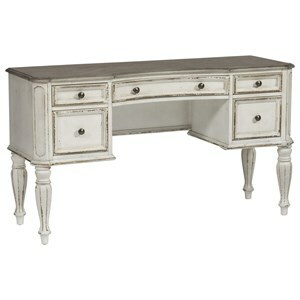 Completed with dark colored metal hardware this desk will make a great centerpiece for your home office. 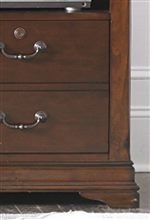 The Chateau Valley Tradtional Jr Executive Desk by Liberty Furniture at Van Hill Furniture in the Grand Rapids, Holland, Zeeland area. Product availability may vary. Contact us for the most current availability on this product. 901-HO105B Jr Executive Desk Base 1 66" 32" 30"
901-HO105T Jr Executive Desk Top 1 0" 0" 0"